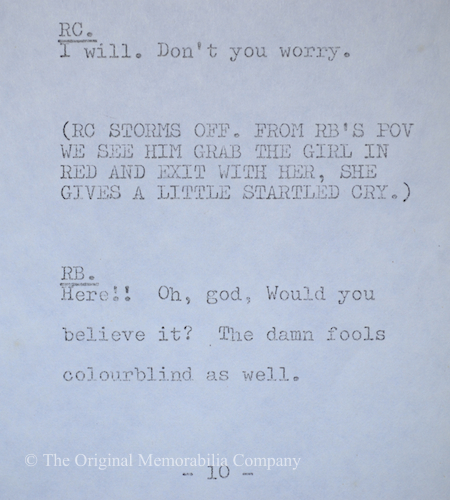 The Two Ronnies 'Stag At Bay' Original Script OFFICIAL TWO RONNIES PRODUCTION SCRIPT. 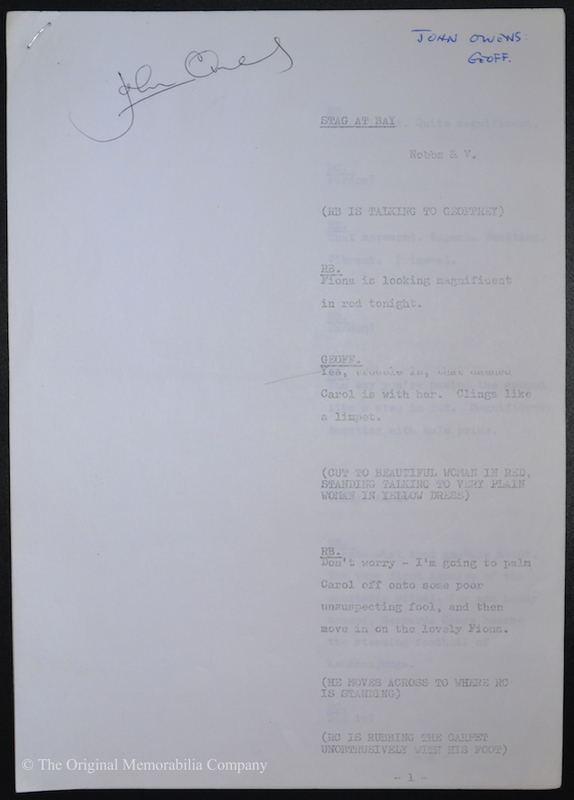 A one of a kind script for the David Nobbs sketch 'Stag at Bay'. 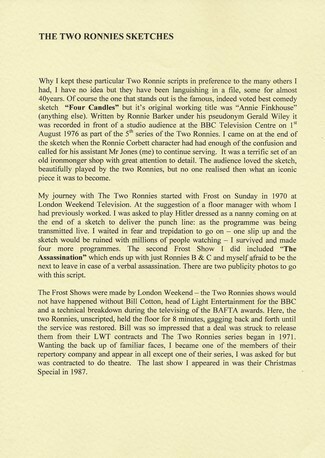 OFFICIAL TWO RONNIES PRODUCTION SCRIPT. 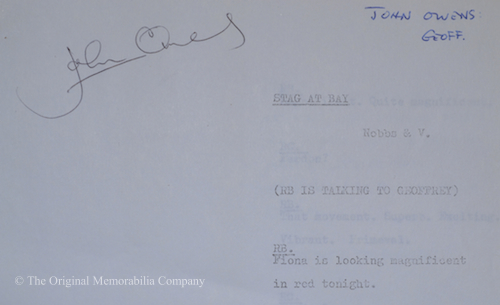 A one of a kind script for the David Nobbs sketch 'Stag at Bay'. 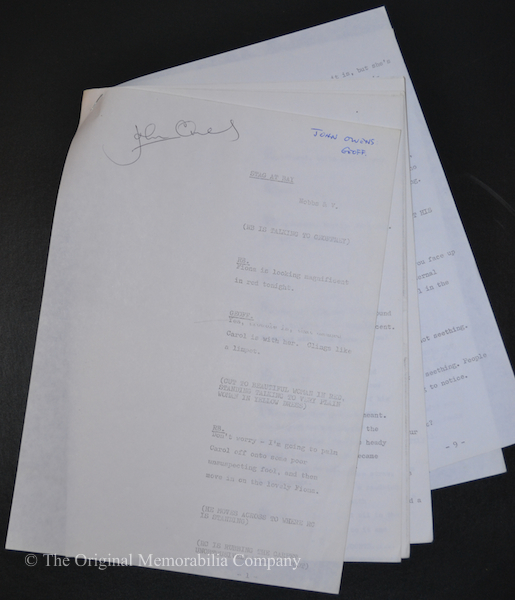 This is John Owens personal 10 page script from the Two Ronnies comedy sketch 'Stag At Bay'. A typical Two Ronnies party sketch written by 'David Nobbs and V'. It is possible 'V' is Valentine Oates, a regular script writer for the Two Ronnies. 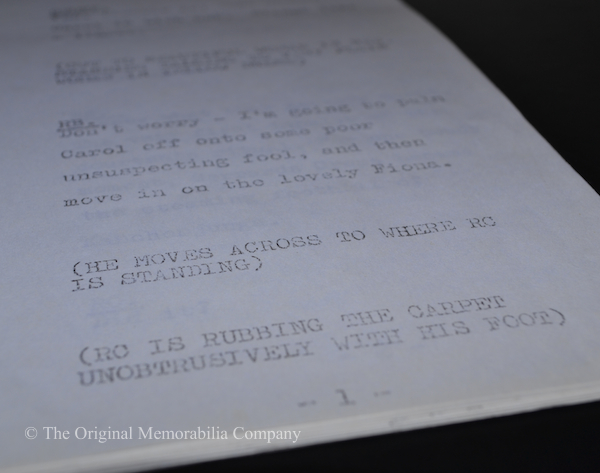 This script has been personally signed by John on the front page and is John's own 'one of a kind' personal copy. 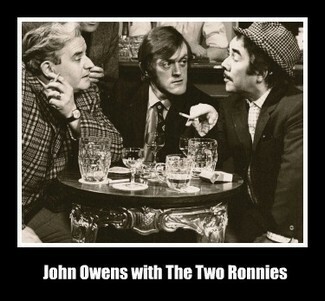 John Owens appears at the beginning of the sketch along side The Two Ronnies playing the part of 'Geoffrey'. To accompany this sale, John has written a very interesting two page letter that talks fondly of his experiences on The Two Ronnies up until 1987 and his part in the iconic 'Fork Handles' sketch. A copy of this letter will be provided with this script. Shows signs of age and has minor creasing and fading but generally in very good condition. 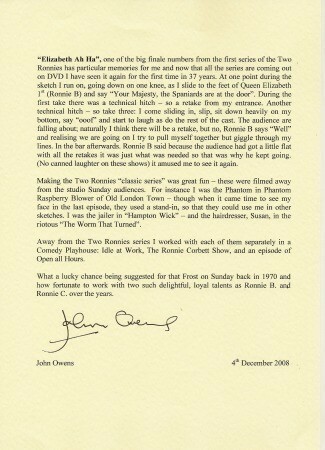 A small pencil marking has been made to indicate Owens character in the sketch and John's name and character is written in blue ink to the top right of the cover page. Your purchase is safeguarded by our unique Document of Ownership & Certificate of Authenticity that is provided with every purchase. See ‘Authenticity’.